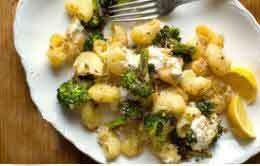 On a rimmed baking sheet, toss together broccoli, oil, cumin (if using), 3/4 teaspoon salt and the red pepper flakes. Roast until tender and browned at the edges, 18 to 25 minutes, tossing halfway through. Remove from oven and set oven to broil.